Hillsboro eighth grade students are shown going through the Real Money, Real World simulation with various vendors. 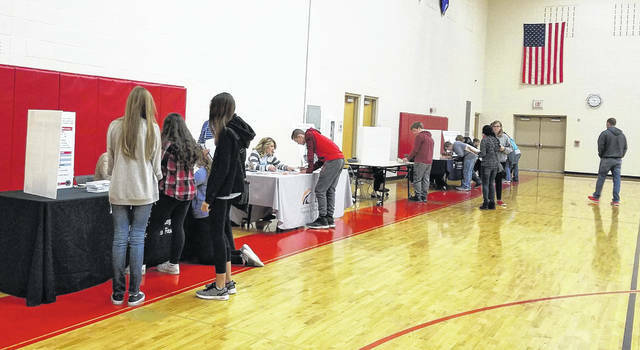 Hillsboro City Schools teachers Zachary Cowan and Brett Prince partnered with OSU Extension 4-H Youth Development Educator Kathy Bruynis to present Real Money, Real World Simulation to eighth grade students on Friday, Nov. 30, following classroom preparation. Real Money, Real World, is a program offered through OSU Extension. It is an active, hands-on experience that gives young people the opportunity to make lifestyle and budget choices similar to those they will make as adults. The students study how occupations will affect their income, learn about payroll deductions by their employers, how to use a savings and checking account, and how to make life choices. The student’s assume the role of a 27-year-old adult who is married to Chris. They receive an occupation, monthly salary, and the number of children (if any) in their family. At the end of the classroom lessons the students complete a real life simulation. During the simulation students interacted with local businesses where they would spend their salaries on “real life” budget items including housing, utilities, groceries, insurance, childcare and transportation. Throughout this activity, students keep track of their finances and attempt to complete the simulation with a positive balance. Students learn what they can afford and what they cannot afford on their income. Many students commented on how much it costs to raise children and that they didn’t realize all the bills their parents have to pay. Local community representatives were: Hamilton Insurance, C108, Merchant’s National Bank, First State Bank, 4-H volunteers, 4-H Junior Leaders, and OSU Extension educators from Fayette, Scioto and Highland counties. Submitted by Kathy Bruynis, OSU Extension educator, 4-H youth development, Highland County Extension area leader, Area 22.
https://www.timesgazette.com/wp-content/uploads/sites/33/2018/12/web1_Real-Money-pic.jpgHillsboro eighth grade students are shown going through the Real Money, Real World simulation with various vendors.